This photo was taken in Racine, Wisconsin. I took this photo during the Winter of last year in Wisconsin. It was about 10PM and around 20 degrees outside, maybe colder. For this photo I used a Westcott Rapidbox and a couple of Yongnuo speed lights. 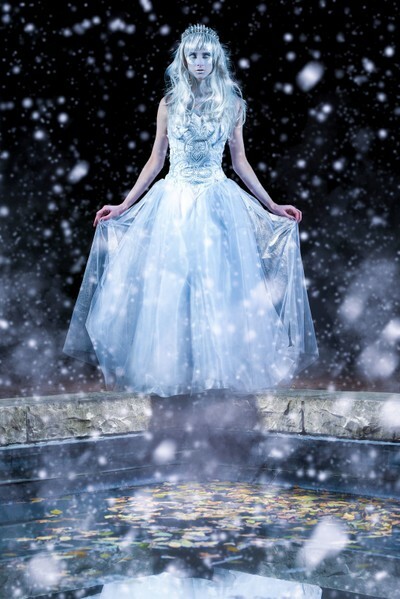 I had the model stand next to a frozen pond and lit her from both sides to give her a dreamy look. I also added a light pointing towards the water to get a reflection. Nikon D750, Sigma 85mm f1.4 Art lens, Westcott Rapidbox and two Yongnuo speed lights. I was one of three photographers asked to shoot for a makeup artist being featured in a magazine. I am a huge fan of surrealism and fantasy so I wanted to make something that seemed ethereal and also make use of the Winter theme. For this photo I enhanced the Winter effect with the snowflakes. Other than that I just played with the color temperature and dodged and burned in a few areas. For this shoot I had a Nikon D750, Sigma 85mm f1.4 Art lens and Sigma 24-70 f2.8 Art. I have since switched my kit to Sigma 24 1.4 Art, Sigma 50 1.4 Art and Sigma 135 f1.8 Art. I also use two Westcott Rapidboxes and Yongnuo speedlights. Find an interesting theme and location and try to create photos that fit your personal taste. I personally like portraits that are close up to show off the expression of the model. As far as equipment goes, I am a huge advocate for Sigma Art lenses. I have sold all of my Nikon lenses because I prefer the look and feel of Sigma Art. I also recommend buying a Westcott Rapidbox, my portraits became so much better when I added this to my bag.